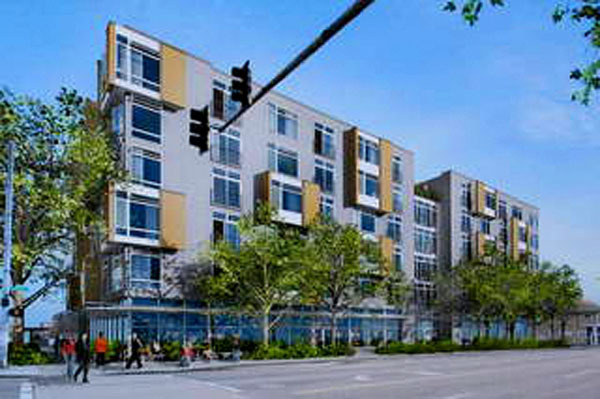 Developer Jim Mueller has been granted a contract rezone raising the maximum building height from 40 to 65 feet for his site on the SW corner of 23rd and Union, see PI coverage here. It’s good news for that troubled corner, and it is encouraging to see the City is willing to make corrections where current zoning is inappropriate. Unfortunately however, it added an extra year to the entitlement process for that project. A big challenge to progress on compact development and reduced car-dependence in Seattle is zoning code that has become incongruous with the realities of today’s world. And one of those realities is that the Puget Sound Region will grow by 1.7 million people by 2040. If we hope to accommodate these people while minimizing our business-as-usual scorched earth policy of unsustainable growth, it will require planning that is both visionary and rapidly responsive. In the past, the City of Seattle has done an admirable job of involving the neighborhoods in planning, but that sort of public involvement adds years to the process of making updates to code. If we are serious about sustainability, we may have to reassess whether or not we still have the luxury of so much time. For example, any credible assessment of the opportunities for sustainable development in Seattle would dictate that at 23rd and Union the maximum building height should be raised to 65 feet on all four corners. But it will likely be something like five years or more before any code change can be made if we have to wait for another full-blown round of neighborhood planning. The neighborhood planning that led to the current zoning at 23rd and Union concluded in 1992. Posted by dan bertolet on	Sunday, September 14th, 2008 at 10:16 am. You can follow any responses to this entry through the RSS 2.0 feed. You can leave a response, or trackback from your own site. You mention the trouble neighbourhoods (i.e. the public) may have with upzoning. But what about the folks on the right hand of the city not agreeing with the folks on the left hand? The Columbia Plaza in Columbia City is zoned 65ft, but the Landmark DRC aren’t happy with any of the developer’s 65ft plans; they argue 65ft doesn’t “honour” the scale of “adjacent properties.” So, I guess that is my second question, how can upzoning compliment existing low-rise development? The problem here is not that we have too much neighborhood involvement. The problem is that we don’t have a system that makes neighborhood involvement efficient. There is no reason that updating neighborhood plans should take 20 years. Neighborhood planning could be and should be a continuous, on-going process that never ends and never has to start up again. Establish a stewardship group for each neighborhood and review and update every neighborhood plan every year. If changes need to happen like upzoning, let it just go through the annual process. Once we get the structures in place, we should be able to have the best of both worlds: neighborhood involvement and rapid response. Second point: the city also needs to do a better job of tying public benefits (such as parks, community centers, and especially transportation investments) directly to development and upzoning. If the city came to neighborhoods and said: upzone in exchange for a park, or upzone in exchange for a light rail station, the conversation would be much different than it is now, because neighbors would feel they were making a trade rather than losing their history. We need to think differently if we are going to survive, not only about density, but also about neighborhood planning. Like density, if neighborhood planning is done right, it can be a very good thing. Done wrong and it’s a nightmare.